If you thought Cajuns were only in Louisiana, then think again. The Acadians originally came from Atlantic Canada and Rupert Parker visits a community in New Brunswick which is still going strong. I’m at the opening ceremony of the 53rd Acadian Festival in Caraquet and I’m feeling slightly uncomfortable to be British. Here in the Acadian peninsular, what they call the 1755 “Great Expulsion” is still very much on everyone’s mind. That was when the Charles Lawrence, the British Governor, decided to round up and expel the entire Acadian community, over eleven thousand French settlers, from Nova Scotia. He used the war with France as an excuse, but, in reality, it was really a land grab for of the most fertile soil in the province. They were scattered to other British colonies, some went back to France, others went to Louisiana and some even ran away and hid in what is now the Acadian peninsula here in New Brunswick. Of course people tell me not to worry, after all it was a very long time ago, and I receive a wonderful welcome from these French speaking Canadians. Surprisingly, their culture is very much alive and over the course of my week here I’m treated to their traditional music, eat Acadian traditional dishes and visit a village inspired by renowned Acadian novelist, Antonine Maillet. The land here is not much good for farming so the Acadians became skilful fishermen. 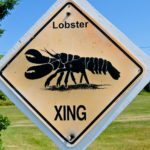 It’s still very much a way of life which means that lobster, clams, scallops and fish are plentiful. The Acadian Peninsula is in the North East of New Brunswick and I take the Via Rail overnight service from Montreal to Bathurst. This is a comfortable way to travel and I have a sleeper cabin with shower and toilet to myself. 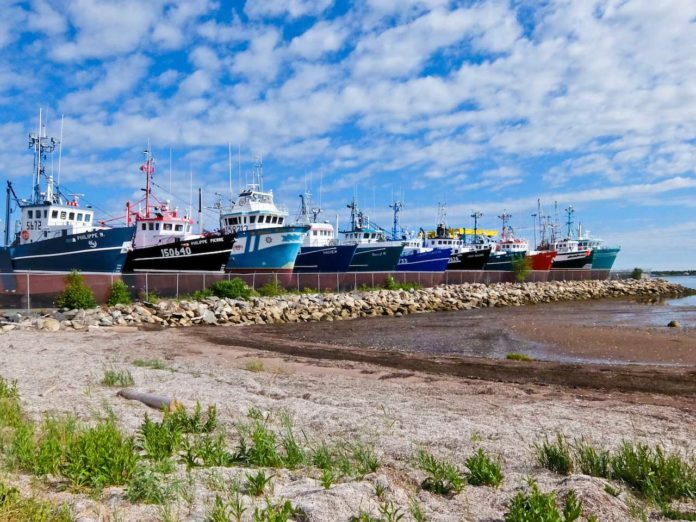 From Bathurst, it’s a pleasant hour’s drive to Caraquet along a winding shore, populated by simple wooden cottages, many flying the distinctive Acadian flag. This is the French tricolour with a bright yellow star, representing the Stella Maris, the star of the sea, which guides sailors in storms. I’m soon installed in the boutique Hotel Paulin, my home for the next few days. Karen Mersereau, the co-owner is an excellent cook and one morning she leads me on a foraging expedition on the seashore. After the opening ceremony of the Acadian Festival, I nip into the Acadian Museum of Caraquet to brush up on the history, then it’s off to the Village Historique Acadien, just down the road. 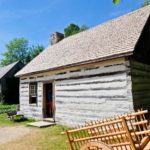 This is a clever reconstruction of Acadian life from the late eighteenth century to the early twentieth, and brings together more than forty historical buildings, saved from destruction elsewhere. Even better, they’re stocked with interpreters in period costumes, carrying out what would have been their daily chores and they’re only too happy to explain what they’re doing. 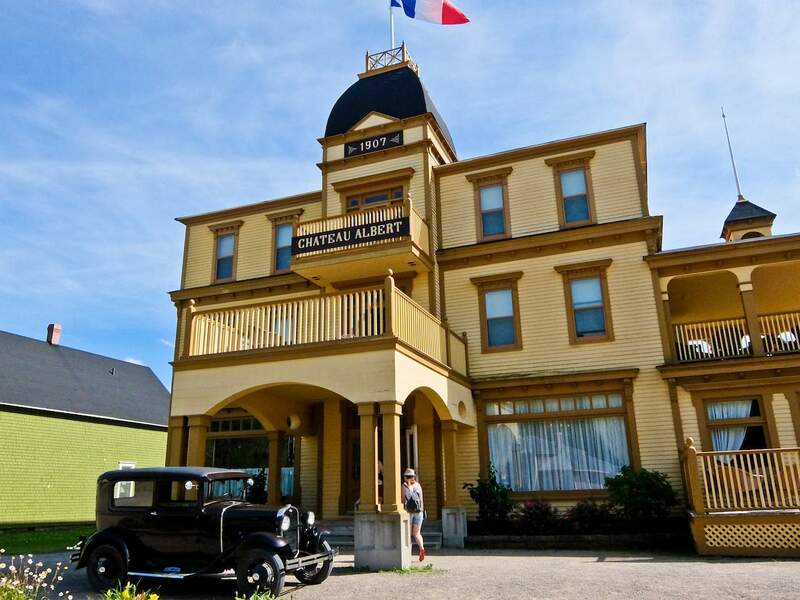 You can even stay in the elegant L’Hôtel Château Albert, eat a traditional meal and be entertained by Acadian musicians. 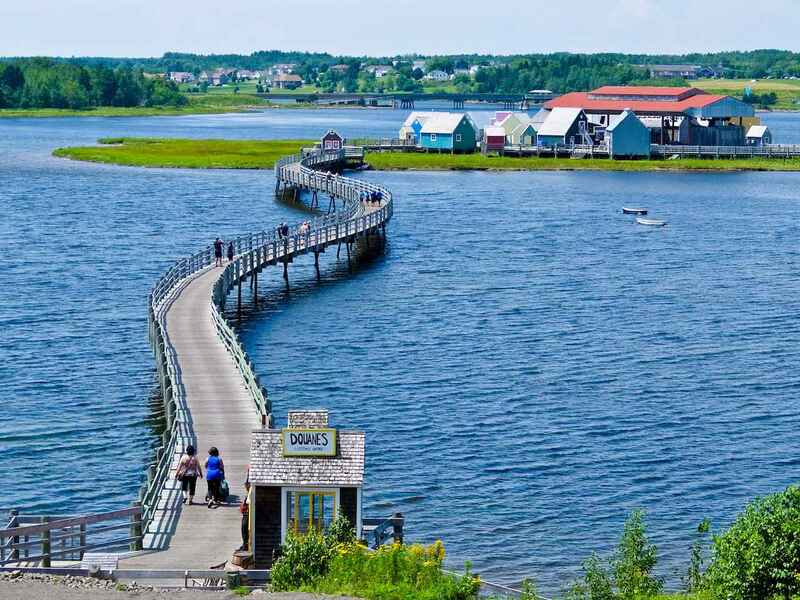 Further down the coast, just outside the town of Bouctouche, Le Pays de la Sagouine, is another historical reconstruction of a traditional fishing village on a tiny island. Antonine Maillet is a famous Acadian writer and her 1971 play, La Sagouine, deals with the life of an Acadian domestic. These characters are brought to life in the village with daily live performances of theatre, music, comedy and dance. You can eat and drink here and it’s worth trying Poutine Râpée, an Acadian speciality – a filling potato dumpling stuffed with salted pork. 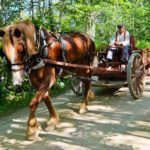 From my base in Caraquet I set out to explore the Eastern parts of the Acadian Peninsula. 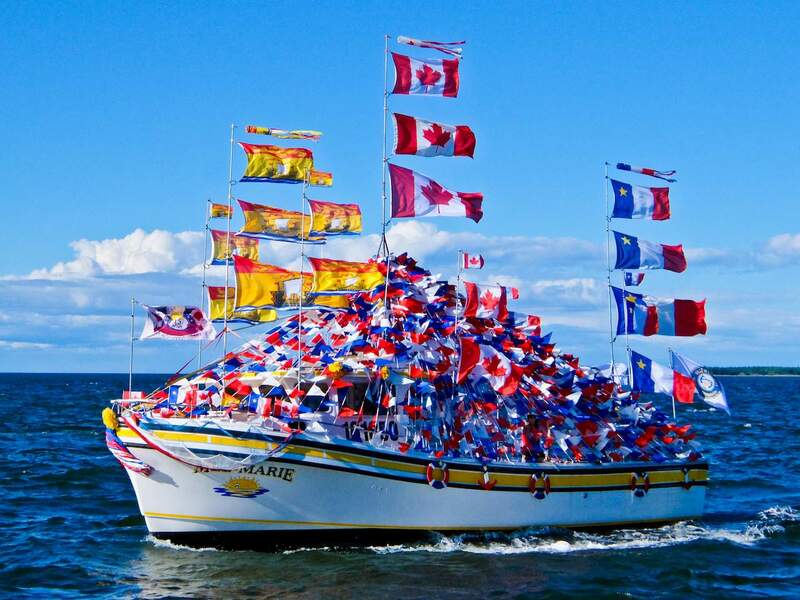 It’s about half an hour to Shippagan, New Brunswick’s commercial fishing capital, full of brightly coloured boats. In the centre of town is the New Brunswick Aquarium and Marine Centre featuring more than 100 species of fish and invertebrates from the Gulf of St. Lawrence, and the lakes of Atlantic Canada. 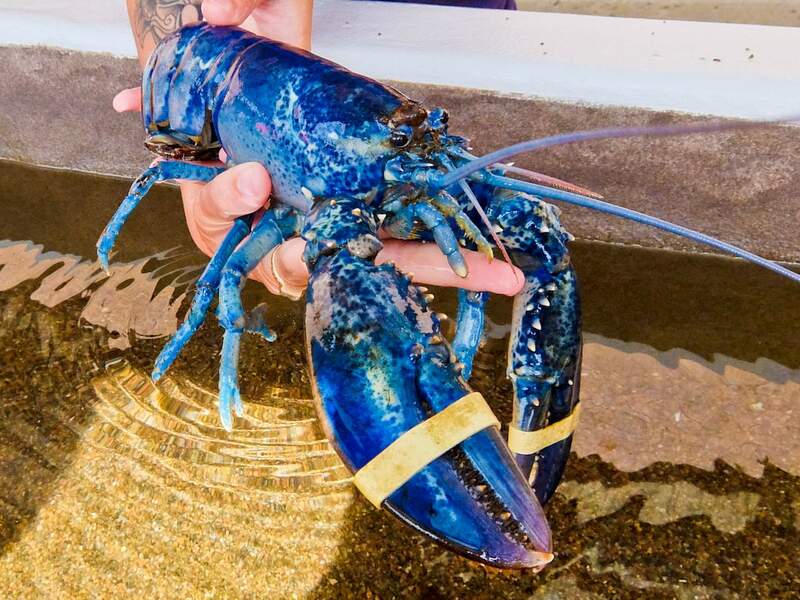 A unique attraction is their collection of coloured lobsters which can come in yellow, tangerine, white and even blue. These are so rare that fishermen only catch one in a few million. 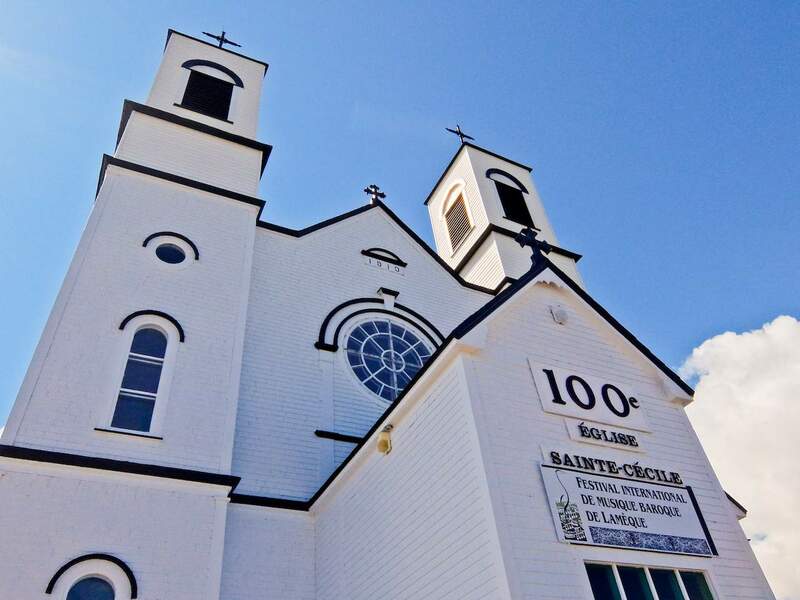 Heading north east I cross the bridge to Lameque Island, stopping at the colourful Sainte-Cécile church in Petite-Rivière-de-l’Île, which holds an International Baroque Music Festival every July. There’s then one further bridge to cross before I reach Miscou, at the very tip of the peninsula. A unique attraction here, believe it or not, is a peat bog interpretive walk, along a raised boardwalk. It’s not particularly exciting but I’m told the best time to come is in early autumn when the bogs turn a fiery red. 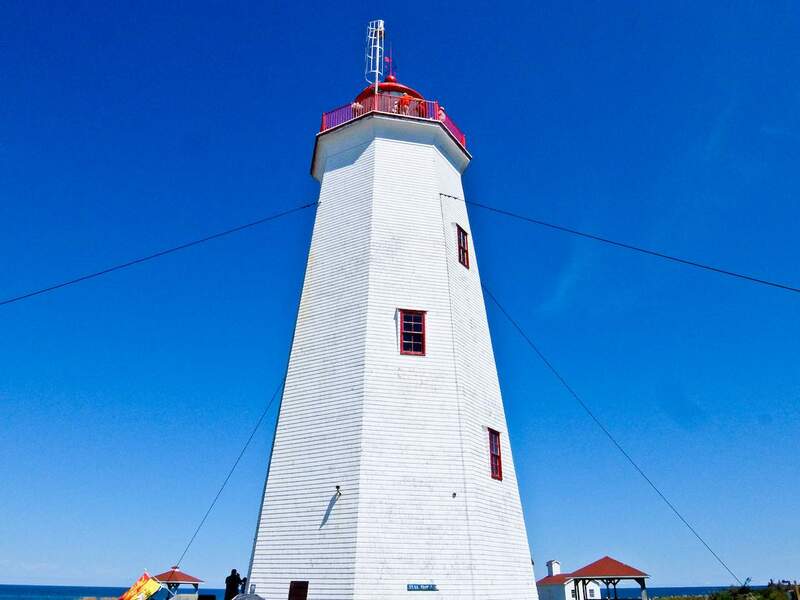 Dominating the island is the lighthouse, a wooden octagonal tower built in 1856 and still in use, although these days it’s automatic and the lighthouse keeper is long gone. At the top there are sweeping views across the island’s deserted windswept sandy beaches and out across the Atlantic. In the summer it’s home to a series of evening concerts and I get a preview of Acadian singer Sandra Le Couteur performing acapella. She sings about the Acadian expulsion and it’s a haunting experience. I end my trip with the Bénédiction des Bateaux, or Blessing of the Boats, in the harbour at Caraquet, as part of the Acadian Festival. Of course the priest is there to offer protection from the dangers of the sea but these days it’s more an excuse for decking out your boat with flags and having a party. And it wouldn’t be complete without a song from Émé Lacroix who’s been singing Acadian music for more than 50 years. Via Rail’s “The Ocean” train travels three times a week from Montreal to Bathurst. La Terrasse à Steve on Miscou Island is great for shellfish. Tourism New Brunswick has information about the province.